Step into the indefinable world of art. A place where you can take a piece of who you are, a dream, a thought, a feeling – or a piece of the world you see around you—and set that expression free through the tip of a pencil, the stroke of a paintbrush, a block of clay or the lens of a camera. 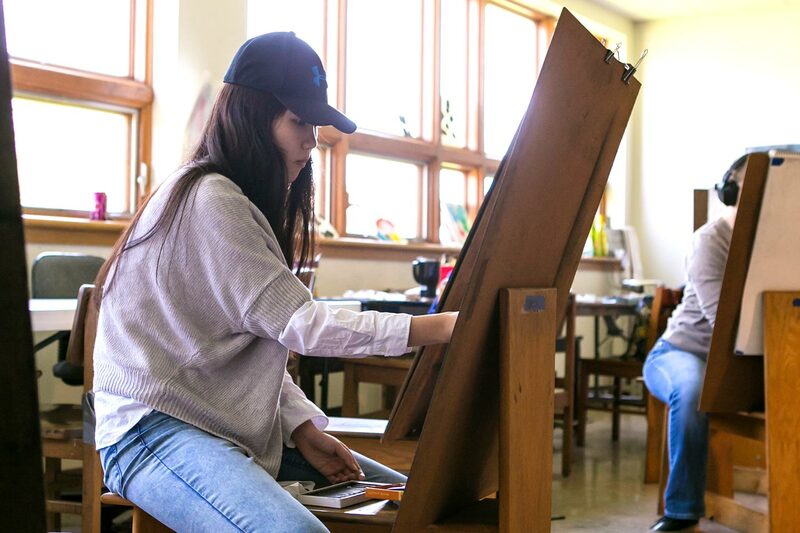 As a studio art major in the Bachelor of Fine Arts program at William Woods University, you will have the opportunity to dive into any discipline of visual art you wish to explore, whether it be drawing, painting, sculpting, photography, or something else. Learn where art has been throughout history and how it’s grown, and discover where you can take it next. "The art program was a great experience for me. The classes were small and the professors really cared about the students. This program helped me to grow as an artist." Jennifer Costello, BFA in Studio Art Degree graduate , founder and owner of Arctic Cards, LLC, in St. Louis, Mo. "William Woods enabled me to academically achieve- to gain a higher level of knowledge in fine arts, photography and business administration, which prepared me to excel in the professional world. The Woods taught me how to find balance in weaving academic, athletic and social interests into my life. The relationships I developed with my instructors and staff enabled me to be dedicated to my academics. The intimate class setting was a positive for me because I could ask questions, feel that I added something to the class as an individual and knew that if I needed extra help the instructor was always available to assist me. The knowledge I gained is invaluable. It has enabled me to develop interpersonal relationships with confidence." Maggie Stolzberg, BFA in Studio Art Degree graduate , photographer and owner of Maggie Stolzberg Studios, in St. Louis, Mo. and Boca Raton, Fla. The Bachelor of Fine Arts in Studio Art degree at William Woods University consists of 122 distinct credit hours for graduation—including 37 core major credits and 33 required elective credits in studio art and art history. Students will gain an understanding of the foundations in color theory. Application of this knowledge through hands on experience will take place in weekly exercises and projects by class critiques. We will also investigate the personal color theories of several significant historical artiest, as well as the color and light properties of several different mediums. Students will emerge from this course with a broad understanding of the remarkable dynamics of color and light. They will be prepared to readily translate this knowledge in the future visual art and graphic design course. Students will engage in criticism and develop an individual aesthetic sensibility as the course progresses. A study of sculpture, painting, architecture and the minor arts from the Renaissance to contemporary times. The main focus is the placement of the art of each period within the society by which it was produced. ART 230 is not required. This capstone course includes production of independent work which will be exhibited during the Senior Show; participation in planning and mounting the Senior Show; a self-assessment report; and presentation of a Senior portfolio. Should be taken last semester of senior year. Meet a long-time William Woods art professor who has been inspiring students to express themselves creatively for generations.